Both CineChamber programs run twice per night, with tickets sold separately for each screening. Programs are 65 minute-long modules comprising 8-9 works from the RML archive, as well as new previews from international artists. CineChamber Classics surveys some of the most alluring CineChamber works originally presented on the platform, revisiting live archived concerts and constructs from a decade ago at the Recombinant Media Labs theater in San Francisco. 62 Minutes total running time. Panorama Paranormal An international survey of spatial cinematic artworks by prominent, historical and emerging experientialists, exploring altered or asymmetrical post-ambient states and poly-perceptual modes of intersubjectivity and aural optic envelopment. 66 Minutes total running time. 1/2/3. Elsewhere, Anywhere / People Are Friends, Path Leading to the High Grass, and Shika by Egbert Mittelstadt: Visuals, and Biosphere: Sound. 4. cm: av_c by Ryoichi Kurokawa, Surround Cinema version. 5. Brilliant Noise by Semiconductor: Visuals and Sound. The module Brilliant Noise takes us into the data vaults of solar astronomy. After sifting through hundreds of thousands of computer files, made accessible via open access archives, Semiconductor have brought together some of the sun's finest unseen moments. These images have been kept in their most raw form, revealing the energetic particles and solar wind as a rain of white noise. This grainy black and white quality is routinely cleaned up by NASA, hiding the processes and mechanics in action behind the capturing procedure. Most of the imagery has been collected as single snapshots containing additional information, by satellites orbiting the Earth. They are then reorganized into their spectral groups to create time-lapse sequences. The soundtrack highlights the hidden forces at play upon the solar surface, by directly translating areas of intensity within the image brightness into layers of audio manipulation and radio frequencies. 6.Halveplane V.4 + Flam V4.1 by Masako Tanaka: Visuals, and Oval (Markus Popp): Sound. Halveplane V.4 + Flam V4.1 is a visual representation of Markus Popp’s Ovalcommers (early 2000’s period), delving to visually simulate fragmentary and densely-layered sound blasts with irregular textured and complex percussive elements. Listeners perceive Oval’s intricate integration of processed audible electrical glitches and tonal instrumental sources alongside Masako Tanaka's ephemeral visual materials. 7. Umfeld by Scott Pagano: Visuals, and Jochem Paap: Sound. 8. Static Room by Scott Arford: Analog Television and Sound. 9. 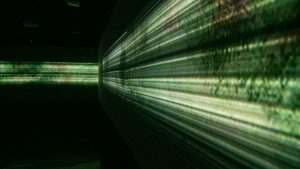 Parallel Head by Ryoichi Kurokawa: Visuals and Sound. 3. Urban Horizon by Egbert Mittelstadt: Visuals and Sound. A turbulent ride through different metropolitan environments like Moscow, Tokyo, Cologne, and San Francisco. 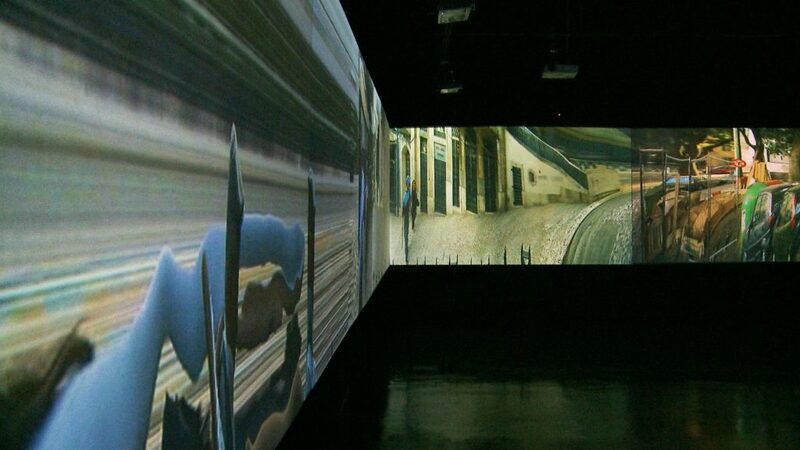 The deconstruction of the footage is followed by a new spatial and temporal arrangement for the CineChamber. 4. Frame Grain by Masako Tanaka: Visuals and Sound. Frame Grain is the re-materialization of fragmented film footage, recombined, collaged and stripped of their theatrical narrative structure, and re-synthesized for panorama pandemonium. 5. Portrait in Half Light by Paul Clipson: Visuals, and Jefre-Cantu Ledesma: Sound. 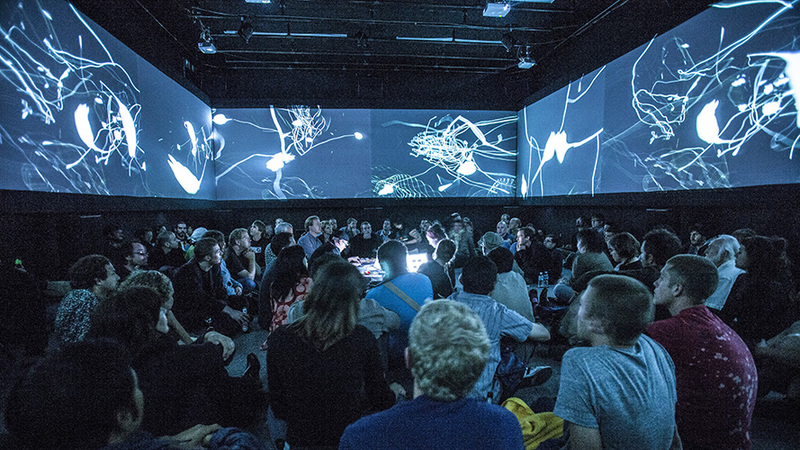 Fundamental Forces is a collaborative audiovisual research project and installation work by Robert Henke and Tarik Barri. The title reflects the focus on movement, acceleration and the interconnections and attractions between visual structures and sonic events, as well as the underlying mechanics in each of the domains. Visual shapes emerge as the result of complex mathematical operations, are transformed and thrown around by the power of the underlying codes but they seem to be alive, there is a sense of plausibility and realism even in the most abstract moments, a sense that is created by the careful adjustments and tunings of all details, resulting in an overwhelming and highly immersive 360 degree projection combined with a deeply spatial auditive component that seems to span a space of nearly infinite size. The final two days of the Recombinant Festival presents evening programs of music-driven audio-visual performances. Saturday night sees powerful experiences from artists Ulf Langheinrich (solo) and his former group Granular Synthesis with Kurt Hentschlager. The night will close with the electronic rhythmic racket project Cut Hands, pushing voodoo and haunted percussion motifs in radical new directions. Saturday night tickets ensure admittance to the entire evening program. 1. Motion Control MODELL 5 Granular Synthesis: Visuals & Music. 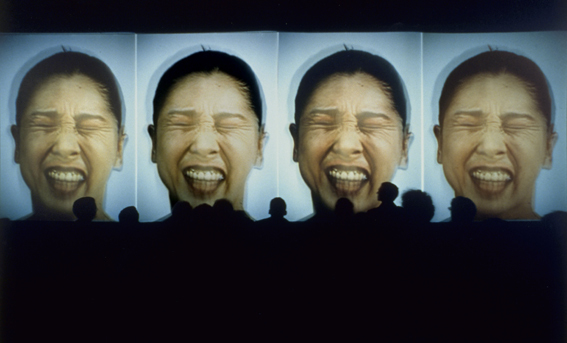 Motion Control MODELL 5 is a performance or installation in which the face of Japanese performer Akemi Takeya is subject to drastic time-based interventions that create in essence a cyborg-like hybrid, between human and machine. A roller coaster dramaturgy following the "life" of the four clones on screens. 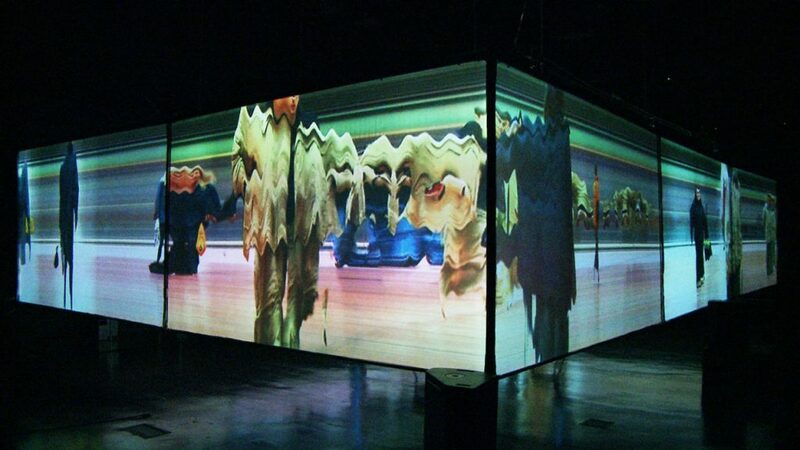 Initially premiered in 1994 at the ICC London, MODELL 5 has been described as one of the most brutiful experiments in bringing digital video to a theatrical setting. It uses a technique derived from the principals of sound design called "granular synthesis" but applies this to the rather fat grains of single video frames (visual content and sound). The audio resulting from this aggressive, shattering granulation is largely responsible for translating the familiar human form into the alien machine. Radically deconstructed and decontextualized, the audio, still in perfect synchronization with but perhaps even more disturbingly abstract than the granulated video-humans, is amplified, multiplied, layered and compressed into an oscillating, pulsating 'living' sonic mass. The result of this represents our species uniquely (inhumanly) and in so doing also defines the essential characteristics of machineness - speed, precision, and unnatural control. We witness the machine processing and reforming human presence. 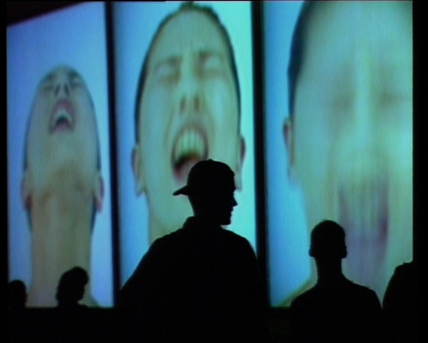 Granular Synthesis is a collaboration between two researchers, Hentschlager and Langheinrich, who specialize in transforming the gestures and noises of human bodies, particularly human heads isolated by video from their bodies, into recombinant, alien screen-based creatures that move, express and distinguish themselves through superhuman performance. In short, Granular Synthesis turn people into machines. 2. Full Zero by Ulf Langheinrich: Visuals & Sound. 3. Cut Hands by Cut Hands (William Bennett). Thematically speaking Recombinant finds a brutally fierce focus through the pulse propelled batteries of African and Haitian inspired polyrhythmic percussive energy of William Bennett's CUT HANDS solo project where caustic full frequency swarms clash, whirl and collide with the electronically driven vaudou / voodoo spirit of the possessed. Intense hallucinatory states of physical and mental motions are torrentially applied in a flurry of skeletal pounding djembes and stabs between eerie calms and thorny panic. The name Cut Hands is a reference to the Whitehouse track "Cut Hands Has the Solution" from their 2003 album "Bird Seed". With the "Black Mambo" / "Afro Noise" to the "Festival of the Dead" album releases already riding the upstream rivers into the hearts of darkness, CUT HANDS continues to confound, scar, manipulate and undermine mainstream music's typical tyrannies of response by allowing its spectators their own personal space to react and to fathom. This is the first in an ongoing series of Recombinant panel discussions. Using the context of the works shown in the festival as a starting point for debates around our contemporary understanding of time-based works, spatial media, and experiential enactments. Featuring two festival artists and other special guests and cameos. Have we passed the Acid Test? - Time travels to the 1966 Factory ethos of Andy Warhol's Exploding Plastic Inevitable (EPI), and the psychedelic San Francisco Trips Festival. An exploration looking back at experiential enactments from the past half century of pioneering intermedia spectacles and installation works, in relation to future thinking on AI and VR for the next 50 years. Sunday repeats the works Full Zero and Motion Control MODELL 5, and closes the evening with the late Maryanne Amacher’s sonic monument "Plaything". A droning, spectral masterpiece that will be played precisely from Amacher's own score, reanimated and amplified live by Naut Humon and Edwin van der Heide. Sunday night tickets ensure admittance to the entire evening program, as well as the Re-cog-Ignition Symposium. Shocking, yet prurient , Full Zero focuses on a total field performance by Chinese choreographer Luo Yuebing. Captured by a remorseless scanning camera, her ephemeral and delicate situation is transformed into an ambiguous body barrage of hypnotic beauty, both sensually and enraptured of the eros and its mortality. 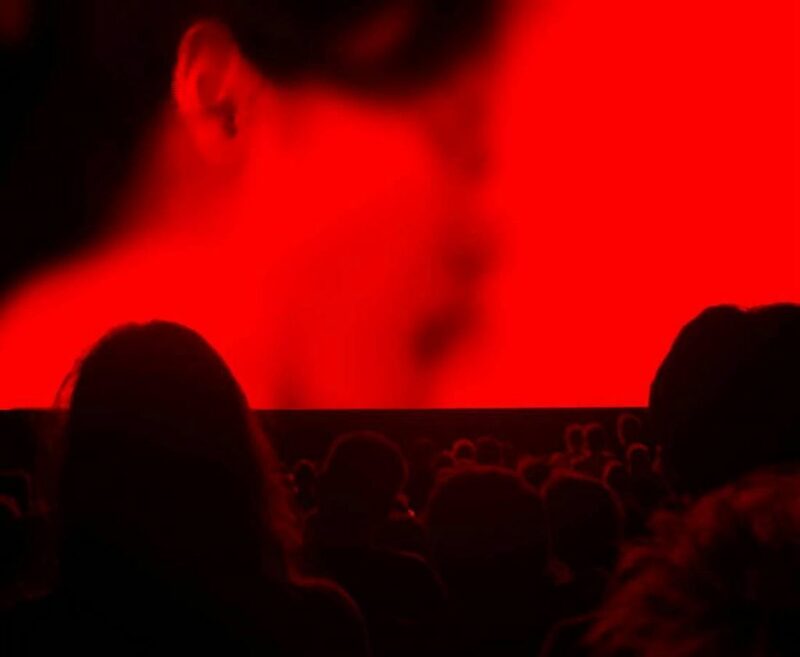 Exhibited on a large screen, the piece imposes a voyeuristic situation upon the audience, where the tension is created in connection with the image flow onto and into the surface as truth or illusion. Seductively disturbing, the work addresses deep desires behind the notions of power in the consummation of ubiquitously available sexual images to viewers in solitude, and in dominion of nothing but their mouse or trackpad. It is essentially about control over people who are addicted to empty images that are inescapable , but uncertain like memories. 3. Plaything by Maryanne Amacher.